I‘ve always loved walking. For twenty years or more it’s been my main source of exercise, and never more so since I moved to Australia. For me, an hour’s brisk walk (and I walk at six or seven kilometres per hour) clears my mind, resets my brain, opens up possibilities, recalibrates my spine and offers me precious alone time. 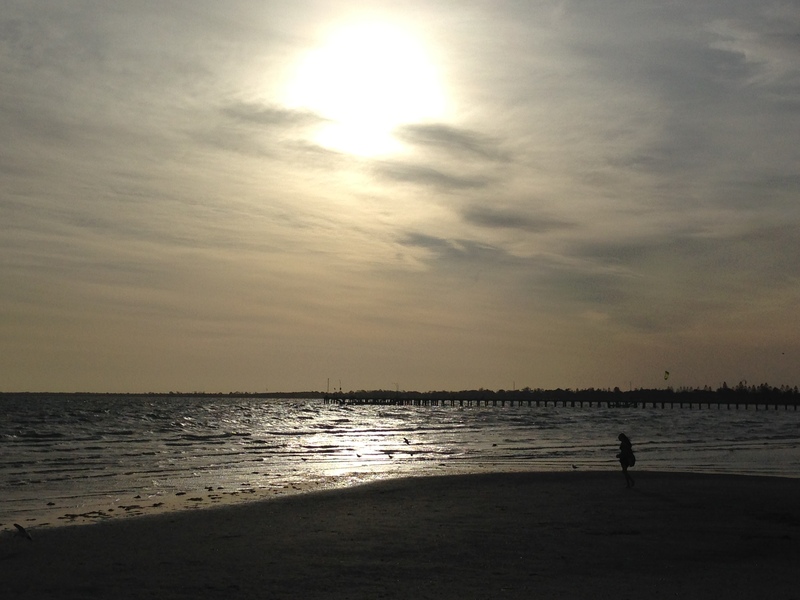 On a good day, when I turn back at the park and head east on Altona Esplanade, I feel so uplifted I could lift my arms and fly back to the car. But it’s taken me twenty years to realise that there is one sort of walk that I adore above all others. I unconsciously seek it out when planning a trip. No other walk every measures up. After two decades of diligent practice I can now say that my favourite pastime is Walking On Very Long Beaches. I didn’t grow up very close to the coast. 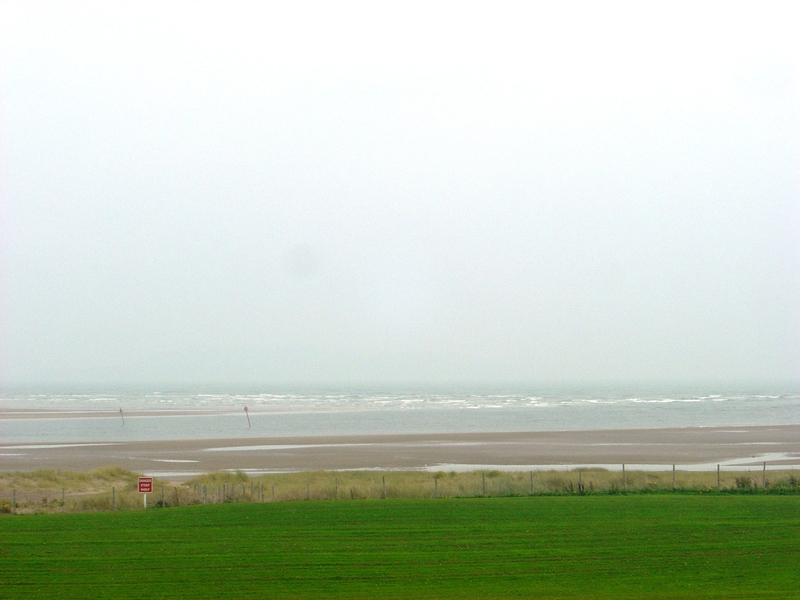 It took half an hour by car or bus to get to Sandymount or Costelloe’s beach in Dublin. But all of my family fare better when close to the sea, and most of us now live minutes (or even seconds) from the water’s edge. I think the turning point for me, though, was ten years spent living in the midlands of England. 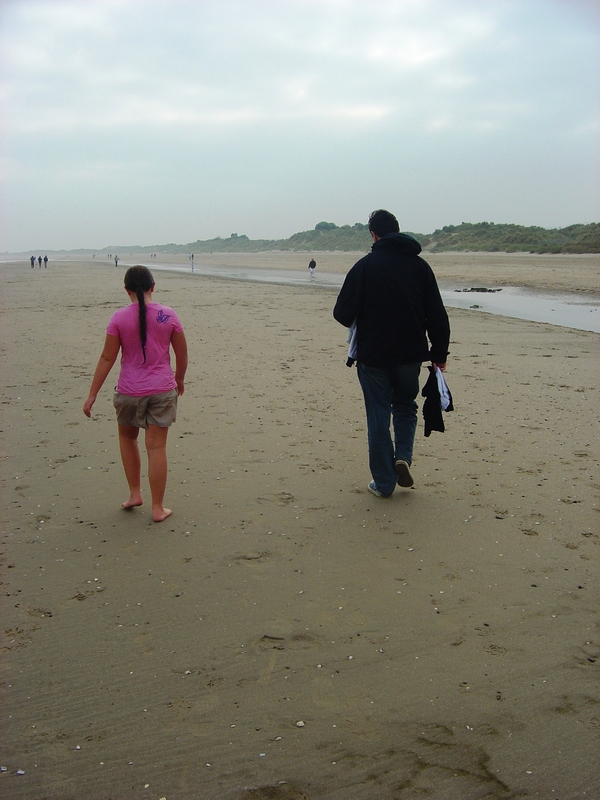 The closest beach to Leicester was Skegness, and one autumn Sunday I couldn’t take it anymore. I pointed my car east and drove a full three hours non-stop to the coast. When I got there, on a chilly, murky spring afternoon, the tide was out. In Skegness the tide goes out about half a mile, so I had managed to reach the seaside without arriving beside the sea. Defeated, I turned around and drove the three hours back, without getting out of my car. 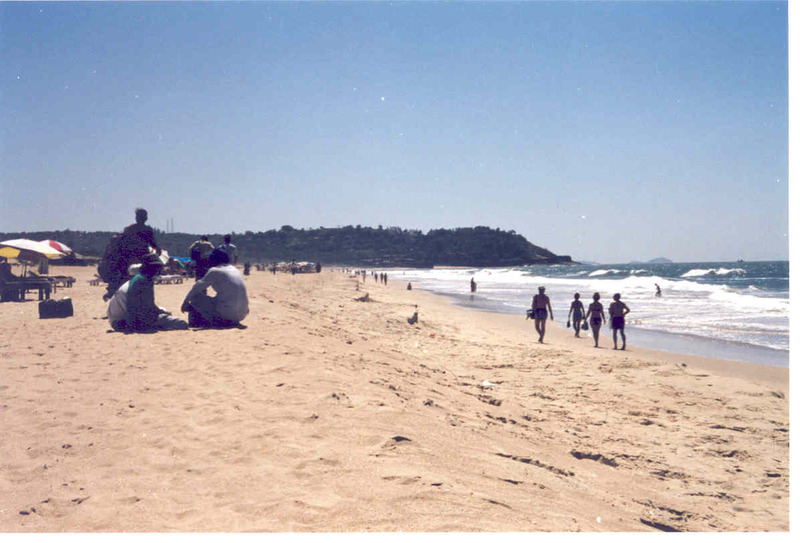 Fast forward a decade or so to India, when I spent many happy months living in the village of Candolim just yards from a six mile long beach. Each morning I walked south to Sinquerim and the old fort, uplifted by the occasional sight of a dolphin just a few feet away in the surf, feeling like I had the whole beach to myself. Afternoons saw me strolling north towards Calangute, where the only concern I had was how far I would walk before jumping into the water to cool down. That beach gave me my sanity back. These days I live about a ten minute drive from a nice suburban beach with a lovely boardwalk and a park at either end. Winter and summer, it’s my favourite place to walk: not too busy, just the right length. If I want a change, I can walk at least an hour from Port Melbourne to Elwood before I run out of footpath and have to turn around. And if I tire of bay beaches and need to hear the crash of real waves, the grand sweep of Ocean Grove on the surf coast is only an hour’s drive away. My ideal beach length is “longer than the time I have to walk it”. In other words, I prefer to run out of time than to run out of beach. These days, the quantifiable self tells us that we should walk 10,000 steps a day, so I like a good 8-9km round trip walk so I can get my daily quota out of the way whilst staring at waves and getting my ankles wet. Every trip I take, I search for a location with a Very Long Beach. Tasmania, Ireland, Vietnam, Queensland, USA, the Caribbean: my travels have taken me to, or taken me back to, some of the most wonderful VLBs in the world. Where are your favourite VLBs? A warm spring evening in Hobart. It’s been a long two days, delivering pre-disaster-season briefings with Julie to a lively bunch of Tasmanian staff and volunteers. We finish a little earlier than expected and I dump the laptop and participant evaluation sheets, change clothes and head out into the late afternoon sunshine. The Radiance of the Seas cruise ship has dominated the waterfront since we watched her dock at eight this morning. I stroll past, photographing the bulk of her, wanting to board just to have a look around, never to be a passenger. Past Mures and the moored fish and chip shops at Franklin Wharf, past our favourite Fish Frenzy (The Frenzy of the Fish, as Julie calls it), a fire alarm spilling post-work drinkers, waitresses and short-order cooks out onto the pavement in good-natured bewilderment. I walk behind three young women, dressed to the nines. One has the dangerously short red lycra dress and the substantial thighs I myself had in my early twenties. The look didn’t look great on me either. Her friend is stick-thin: she is having trouble keeping her tiny tight skirt covering her barely-existent behind. The one in the middle has a few more pounds on her, and a few more acres of fabric. Despite everything, she looks better than the other two who are just trying too hard. Aurora Australis, the Australian Antarctic Division’s exploration ship has gone south for the summer, leaving a gaping hole at the dock beside Shed Number One on Prince’s Wharf. I head down Castray Esplanade, past the beautiful homes once owned by harbourmasters and ships’ captains. I detour briefly through Prince’ Park and continue on through the historical Battery Point area. The sandstone houses and single-storey artisan cottages transport me back to Dalkey, to Sandymount, to Malahide, to Wicklow Town. These few nineteenth-century streets are part of the reason I love Hobart so well – it reminds me of home. As I pass the Franklin Dock the Radiance of the Seas gives three long blasts of the ship’s horn. Her engines are going astern, and she is off to the next port. I stand with a young family and a handful of tourists as the mammoth cruise ship floats imperceptiby away from the dock. The captain gives another three blasts of the horn, then another, and finally she is off. 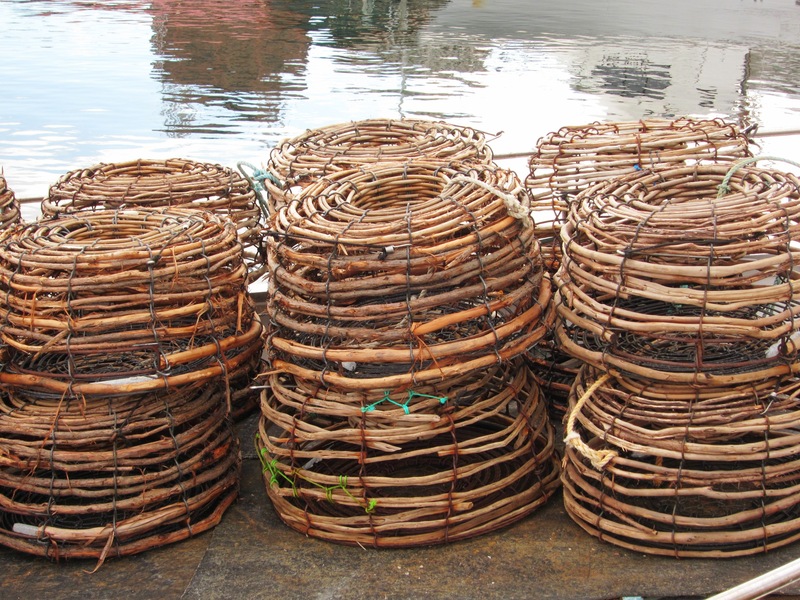 I continue along the waterfront towards the Henry Jones Art Hotel, passing lobster fishing boats, back to my hotel to freshen up. Later I retrace my steps through even larger throngs of people out for the evening. The HoTown crowds are out in force, the balmy evening producing even shorter skirts on the girls and even fancier shirts on the boys. I am stopped by a gang of six women looking for a good place to eat. It’s the third time in twenty-four hours I have been stopped on the street in Hobart and asked for a restaurant recommendation. Luckily, I have plenty of opinions. Salamanca Place is buzzing as I stroll past, and I opt for Ciuccio’s, a frequent haunt of mine and a perfect place for this early summer’s evening. A couple of glasses of McLaren Vale shiraz and one garlic chill prawn pizza later, I brave the crowds once more. 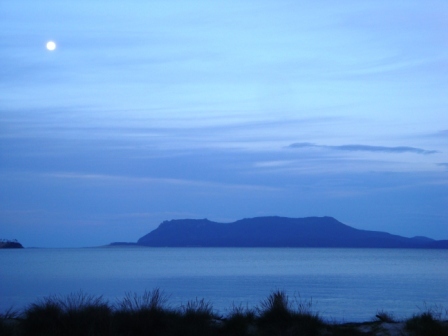 It is after nine at night, not quite dark and still over twenty degrees – not at all typical Hobart November weather. The atmosphere is party-like and the crowds belie the fact that is merely a Wednesday night. It feels more like Christmas Eve. I wend my way back along the waterfront to my hotel room, feeling lucky that I can visit this town as often as I can and that I am almost always blessed with perfect weather when I do. 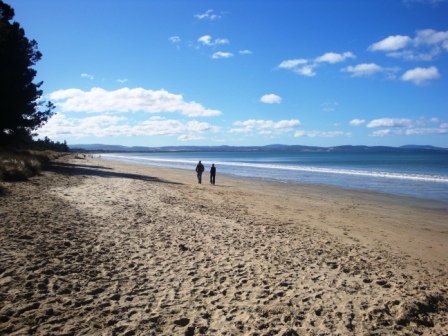 An opportunity to spend a little time in Tasmania is always a good thing. 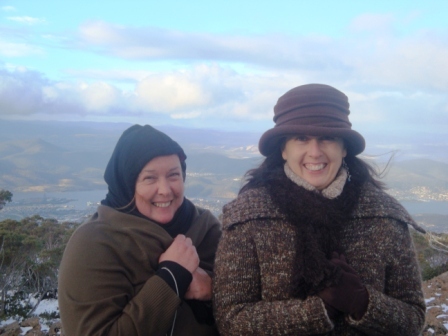 And so it was that I organised to stay an extra twenty-four hours in Hobart following a work trip. It was all going swimmingly until I got sick. I’d had a useful meeting with colleagues, raided the Red Cross second-hand bookshop and even had time for a shot of late-night shopping after work. The weather was unseasonably warm and it promised to be a beautiful evening. But my temperature was soaring and by six o’clock on my free night I was sitting in my hotel room unsure whether I was well enough to venture anywhere. I took a look at my basic hotel surroundings, and imagined the early-summer evening I was missing outside. This was what I promised myself: an evening out on a date with myself, a good glass of wine and Salamanca Market in the morning. What was I thinking? I dosed myself up with more aspirin, changed, and headed out with a new book. The evening was beautiful. Dressed head-to-toe in black and wearing boots, I was the odd one out. It was all the clothes I’d brought with me. 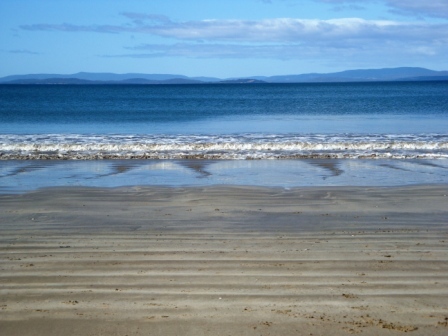 How was I to know Tasmania would transform into a tropical paradise instead of its usual cool temperate maritime vibe? Young women strolled arm in arm dressed in strapless maxi dresses and strappy sandals. Young men scrubbed up well and sported the latest logo tees and edgy hairstyles. Even the over-sixties tourists sported jaunty spring-summer outfits with their Tevas. Down by the Elizabeth Street pier a beautiful ketch got ready to cast off, crew on board. The sky turned all colours, then settled on lavenders, pinks and blues as the sun set through the high clouds. 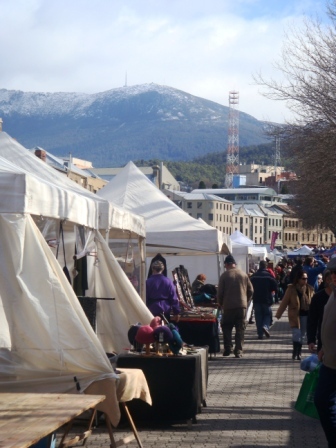 I strolled towards Salamanca Market and selected a restaurant. Ciuccio’s in Salamanca Place looked inviting and I craved pasta. I headed inside. Dining alone is a treat for me. Many people I know dread the thought of eating alone anywhere, whether away on business or even just out at lunch from work. I love it. Since my twenties I’ve loved getting all dressed up and taking myself out to dinner, alone, or sometimes with a good book. I sit at my table, hopefully with a good view of something – the scenery, or other diners, or the world outside, and drink it all in. Whether it is the changing view before me or a chance to people-watch, or perhaps to look like you are people-watching but you are actually in deep thought about something else, there is nothing like it. Sometimes it is a more internal experience, when I open my book and settle in for an evening of good food and wine with my reading. I choose dishes that can be eaten with one hand – risotto and small pasta shapes are perfect – so that I can hold my book with the other. There is no need to compromise on ambience or quality of food just because one is reading. Just because I was reading, I still had a chance to do a little people-watching. The two men beside me were an enigma. I could not figure out whether they were brothers, father and son, colleagues or a couple. The larger table in front of me was a couple and their respective parents, perhaps meeting for the first time, or certainly their first formal evening out together. The couple to the other side of me were innocuous-looking for the most part, except they’d spent the evening playing noughts and crosses and other children’s games on their paper tablecloth with the crayons provided on each table for just that purpose. I paid the bill and headed hotelwards not long after nine – well, I was poorly. Salamanca Place was still buzzing and the sun had only just set. Amazingly the temperature still hovered around the high twenties and it felt a little like summer in Dublin. Enjoying the solitude, I picked my way through groups of students congregated on the grass and the odd Hobart Show dropout in all their finery, back past Franklin Wharf and along by the fish places moored in the little enclosed dock. Next morning after a good night’s sleep, I retraced my steps back to Salamanca Place for the Saturday-morning market. It was a good deal cooler in the morning, so my all-black outfit and sturdy boots looked less out of place. I strolled the aisles, unencumbered by any companions whose interests I had to accommodate. I flitted from jewellery stall to book stall, lingering over pieces that caught my attention without feeling I was delaying anybody. The sizzling of those gourmet sausages seriously tempted me, and this was the only time I felt the loss of a pal: logistically, it was not possible to purchase a currywurst outside and a glass of bubbly inside, and still be sure of a pavement table at which to enjoy it all. As Mena succinctly put it later, I didn’t have anybody to mind my sausage… Defeated, it was back to Salamanca Place where I found a nice “gawky” seat at Barcelona, where a healthier breakfast of eggs florentine awaited. I sat, book in hand, but this was a much more tempting place to people-watch. A young student entertained us in the centre of the Place with beautiful renditions of operatic arias. People from every cafe and restaurant applauded each piece he sang. The fashions of the young women had not abated since the night before, even though the temperature had. I sat, barely keeping my own body at a decent temperature, watching in fascination as outfits more worthy of a Gold Coast housewife wandered past. Two young children, one dressed as a fairy with a denim jacket, the other in top-to-toe OshKosh, played with a twenty-first century frisbee as their parents waited in the ATM queue. A bunch of young women in one corner of my cafe postured and tinkled with laughter for the sole benefit of a bunch of young men in the other corner. I didn’t buy much: a small birthday gift for a friend, some chocolate for Orlando, some more chocolate for Orlando, and a little shopping bag to send to Ireland for Annette. It was the browsing I enjoyed, all at my own pace and without the need for conversation or compromise. Yes, even I like silence sometimes, and a solo half-weekend was the perfect time for that. I like lastminute.com. Not as a website, but as a lifestyle. And so it was when I was sitting in one hotel in one state capital (Sydney), I conspired with Mena to make another trip to another hotel in another state capital. But not any other state capital, our favourite. Hobart. Yes, it’s winter. 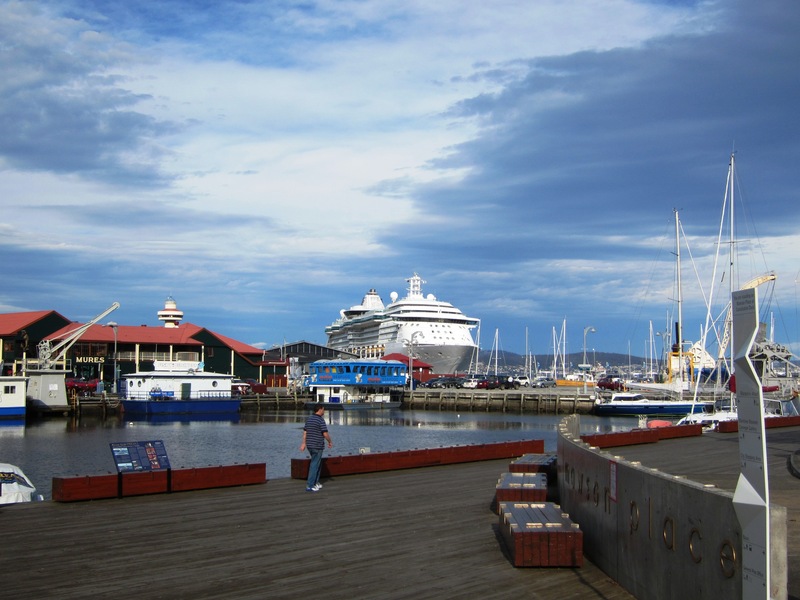 Yes, Hobart is at the same latitude south of the equator as Buffalo, New York is north of the equator. (Buffalo’s mean temperature on 21 February 2010 was -2°C). We didn’t care. The main issue was getting up at 4.30am to get a very early flight. Ryanair aren’t the only sub-human airline in the world. The upside of this was that we were parked at our waterfront apartment and already browsing the famous Salamanca Market before eleven in the morning. The place was hopping, and they weren’t all tourists. Stalls stretched as far as the eye could see from Macquarie Street to Prince’s Park. We tried chilli chutneys, blueberry jams and fresh breads. I bought two brown hats in the space of three minutes. Why not? We gravitated towards trestle tables filled with bric-a-brac and managed to purchase a sum total of no jugs. I told myself I needed no more scarves or necklaces. And then it was lunch-brunch-time. We wanted to sit down, but outside. I wanted savoury, Mena didn’t mind. There was coffee and doughnuts. No. There was elderberry wine. No. Then I had a brainwave. Two currywursts from the sausage stall, washed down with two glasses of the local bubbly purchased from Irish Murphy’s, which gave us the right to sit at an outdoor table. Marvellous. When we’d eaten and drunk our fill, bought sufficient headgear and things in jars, the day was half-gone. 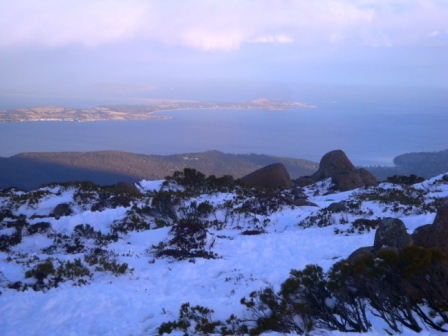 We wandered vaguely in the direction of the summit of Mount Wellington in search of winter sun and perhaps a snow view or two. A traffic accident made us stop awhile in the Fern Tree tavern, the biggest waste of a bar I’ve ever seen. We sat in a faded eighties-style café area by a beautiful log fire, drinking coffee and eating very good home-made fruit cake. And that’s all I can say about the place. I think there was a stunning view across Derwent Bay, but at four o’clock on a Saturday afternoon the curtains were closed and the dining room in darkness. I think there was a decent wood-fired pizza oven but you had to walk through a grim pool hall to get to it. No wonder the local convenience store across the road was busy serving many more people. At least they had daylight. At the summit of The Mountain (at 1,271 metres, only 75 metres lower than Ben Nevis and full 240 metres lower than Carrantuohill in Ireland) the car park was full. Some weird atmospherics mean the remote locking on your car doesn’t work, which doesn’t help when it is blowing a hurricane and you can’t feel your hands. We ventured towards one lookout across a shaky-looking boardwalk, then braved the icy wind and sub-zero temperatures (with wind-chill it was close to -10°C up there) to catch a glimpse of the view across the bay. Despite losing the feeling in my hands, it was stunning, and well worth the Arctic conditions to experience. Later, back in Salamanca Place, we settled in to the Ball and Chain Grill with a glass of wine and a half-decent steak, but the free salad bar kept reminding me of the old Pizza Huts in London and sort of put me off in the end. Nevertheless, the food was fine and the atmosphere cosy so we didn’t mind. Next day, the weather was unseasonably mild and sunny, and we spent a lovely Sunday wandering the country roads of the Tasman peninsula. Seven Mile Beach near the airport was staggeringly beautiful at ten in the morning, with hardly a breath of air, perfect blue skies and a tiny bit of warmth in the spring air. 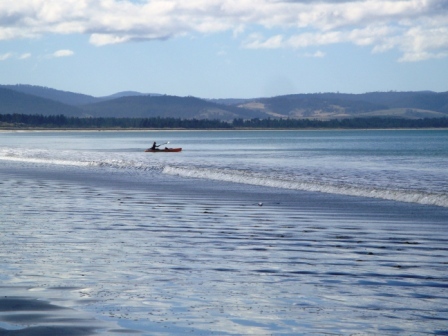 People strolled along the curve of white sand or kayaked in the still bay waters. 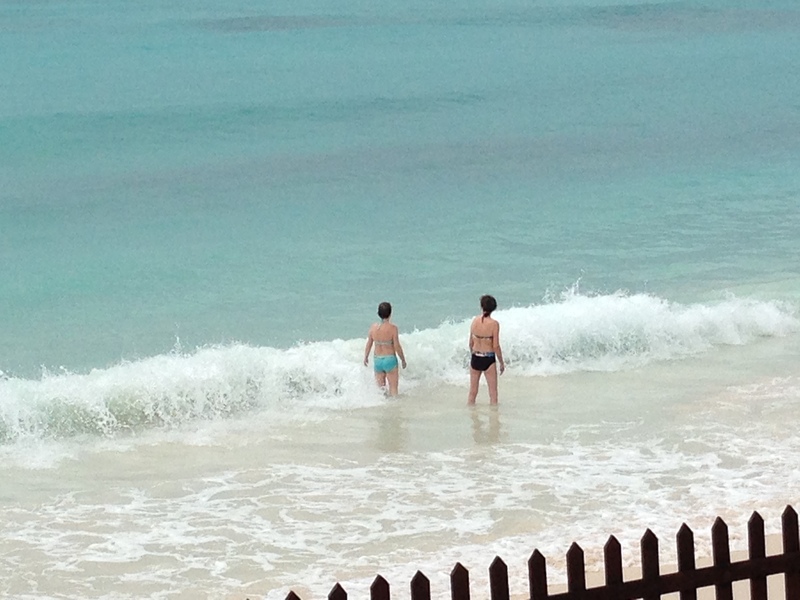 We stood and drank in the view and listened to the waves and knew we would be back for a longer visit. Laneway after laneway gave up treasures of stunning view after stunning view. A return visit to Dunalley meant lunch in the wonderful Dunalley Waterfront Café, housed in an old fish cannery right by the little fishing pier. 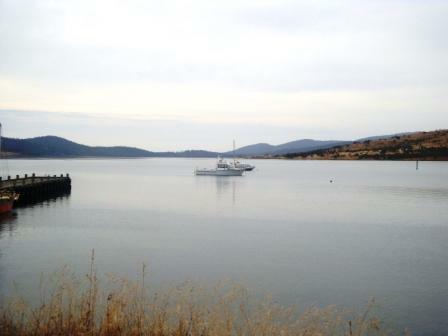 Stunning views over the bay accompanied our lunch of fresh seafood pie washed down by Tasmania’s finest bubbly. It doesn’t get much better than this. Later in the evening, back at Salamanca Place, we lounged in Cargo pizza place and bar, downing enormous wood-fired pizzas and lashings of wine before retiring to our penthouse apartment with yet another bottle of Ninth Island sparkling wine. This is the life. 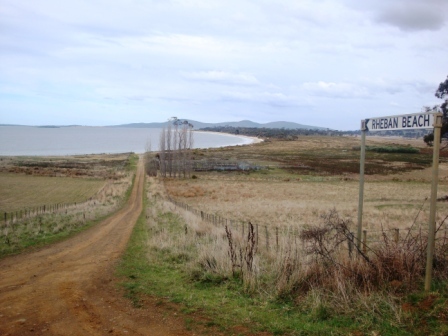 Our last day of the long weekend took us north-east along the east coast, in the direction of Freycinet. Yet again, we were stunned by the spectacular views around almost every turn of the road. A tiny laneway took us down to Rheban Beach, a perfect crescent of deserted beach tucked away from view, overlooking Maria Island. 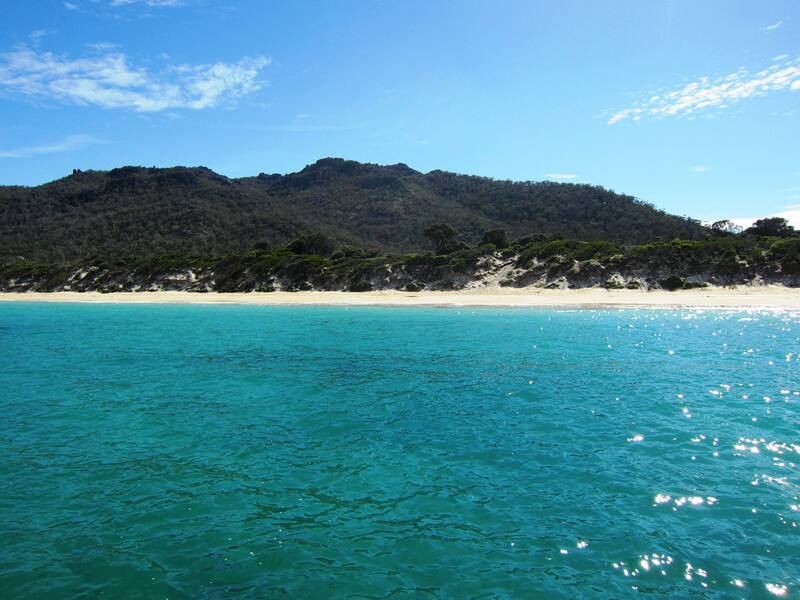 Why doesn’t the tourist board show these amazing views as well as the ever-present Wineglass Bay? We knew we would have to come back to experience even more of this Tasmanian secret. Back to the airport late in the evening, we stopped in Sorell for an early supper. Heat Pizza across the road from McDonalds was one of only a few places open at seven on a Monday night. 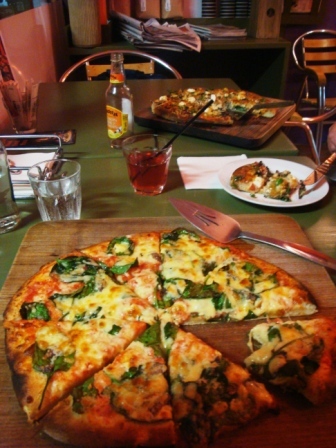 We were not disappointed by the light fluffy pizzas with a perfect amount of topping on, served with a smile from the wood-fired oven. Except, typical Doyle, we ordered too much and had to leave far too many slices behind. As we left, I swear somebody in the town turned off the rest of the lights. where did that blizzard come from all of a sudden?